Back in early May I went to Foxlease for an INTOPS (international opportunities) selection weekend for leaders. I was offered a place leading one of the three trips available, although I couldn't tell people where I was going as we were all sworn to secrecy until the girls' selection weekend at the end of June. Which has now happened so everyone can now know! In 2017, I'm leading the SWE region trip to Iceland! I am just a little bit excited! I know a few people who have been, and they loved it, and I cannot wait to get planning it all! 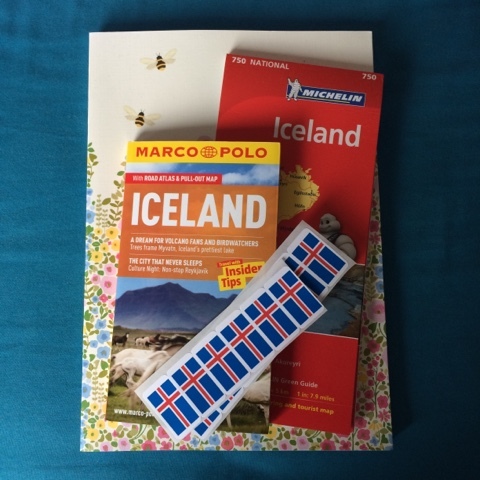 The first thing I did was to buy a new notebook (essential for the planning process) and I ordered some Iceland flag stickers (also essential, I feel). We all headed back to Foxlease for the girls' selection weekend. They were from all over southwest England (including the Channel Islands) and had gone through their County selection process already, so we knew we were going to have a great bunch of children. The purpose of the weekend was to decide which of them are ready for an international trip like this, and if they are, then to decide which trip would be best for them - there's a camp in the Netherlands next year, my trip to Iceland (a few days in Reykjavic, followed by ten days of outdoor activities and a conservation project), and a service project in Kenya in 2018. We had more girls than spaces available, which was a bit sad knowing not everyone would get a place - but the girls knew this, and it's the nature of a selection process - frustratingly, we do get rejected in life. The girls have to be 14 next summer in order to be eligible, so our youngest girls this weekend were 12 (nearly 13) and the oldest were 17. Most of them didn't know anyone, and they were all mixed up throughout the weekend to see how they got on with different people, how they worked well together, what they found easy, what they found challenging. There were lots of activities on Saturday for the girls to do, from team logic puzzles to activities on the lake, to preparing lunch for the leaders. They were observed the whole time by the trip leaders, subtly making notes! The girls also had a 30 minute 'informal chat' with two leaders, which is what I was doing on Saturday. They had to bring up to ten small items in an 'all about me' bag, to tell us all about them - what's been their best moment in Guiding, what do they like doing, what do they think they're good at. This was my favourite bit of the weekend, it was just lovely to listen to teenagers chattering away about what they want to do with their futures, and this was rather reassuring after the referendum result! The UK does have a bright future after all! It was also a great chance for us leaders to get to know each other better - we were sharing rooms in our groups (named for colours, as the girls were not allowed to know where they might be going) and so I was sharing with the rest of the blue team - we were chatting way past midnight on both nights, and it's reassuring that we're going to get on and have already reached the stage of being able to gently tease one another! On Sunday the girls found out the destinations - but still not knowing which colour team is associated with each country. The girls had to fill in an evaluation form, with their trip preference, and we didn't want them to be influenced by any of us (quite a few girls put me down as a leader they'd like to go with - always nice to feel liked!). After a parents' meeting (when we were finally revealed!) we took in an evaluation form from the parents and then the process of deliberation began. Well, before that I took the two girls from the Channel Islands to Southampton airport to get their flights home - it was lovely listening to them chattering away in the car, they'd had a great time and were really excited about the trips, and also got very excited when I overtook two caravans, a mobile home and a horse box (complete with horse) on the motorway - I'd never really considered motorways as exciting things, but I suppose they are when you live on an island with a top speed of about 35mph! Back at Foxlease, us leaders sat round a table and went through each girls' paperwork - their evaluation form, their parents' form (if their parents say they're not happy with their daughter going to one of the countries, then it doesn't really matter what the girl or leaders think!) and also the leaders' comments - were they suitable? Would they find one trip too challenging, another too easy? Did they work well with others? We were there for a good two and half hours, and generally agreed as leadership teams - some girls I'd spoken too I thought were great, and would be best suited for the Kenya trip, some girls the Kenya leaders had seen and thought their attributes meant they'd be best suited to Iceland. So we went through each one, deciding if we thought she should get a place, if she's not quite ready and should try again next year, or if she wasn't suitable at all. Bearing in mind we have more girls than places, it was quite hard - I know we assigned more girls to Iceland than the 16 we can take with us, so Kate (the international adviser) now has the unenviable task of taking our comments away with her and then making her final, final selection. Girls will find out in August if they've been selected, and to where - as leaders we find out in October when we meet for our risk assessment weekend (what fun!). Overall, it was another great Guiding weekend - the girls all had a great time (hopefully they will still think this when they find out the selection results!) and I enjoyed getting to know the other Iceland leaders. We're going to have a brilliant trip and I am so looking forward to finding out which girls we're taking with us so we can start planning our first pre-weekend for early 2017. I've said it before and I will say it many more times, I am so grateful to Guiding for the opportunities it gives to me and others, for the friendships I've made and the friendships I've yet to make. Iceland, we're coming! Organising a trip to Iceland sounds amazing! I would definitely say the new notebook and stickers were justified necessities for the process; few things beat buying new stationery! I've also spent £5.80 (madness, I know) on two flags, one Iceland and one Union flag, each 5ftx3ft. Again, essential purchases. Oh my goodness, what a great privilege and you are in such a position of responsibility! "Lucky girls!" is all I can say! Iceland is lovely, I really enjoyed my February visit there in 2000!